There’s 5 reels and 9 paylines at the bottom of the sea for you to play new slot sites with. Join the flounders and mermaids at the bottom of the ocean for some online slot gaming and look out for the crustacean symbols which bring the biggest rewards. Novomatic is part of the Novo group, an international business franchise that owns businesses in over 60 sectors around the world. At the same time, Novomatic it is one of Europe’s top producers of casino gaming titles, having a vast product catalogue. As well as delivering virtual gaming solutions, Novomatic is also dealing with real, physical gaming equipment, providing high-end machines to casinos in over 70 states. 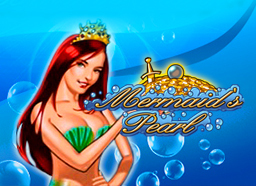 Games like Mermaid’s Pearl is one of the both, physical and virtual slot machine games that projected them into leading both industries. Find more Novomatic games here on Easy Slots. Let’s go snorkeling with this one and see the wonders of the sea. This 5 reels, 20 pay-lines slots, marine-themed slots game from Novomatic engages you in a submarine trip to discover the amazing creatures that inhabit the sea’s deepest corners, while having loads of fun and endless opportunities to win whooping prizes. Being carefully and cheerfully designed, with a ton of blue tints, referring to the gradient of blue that we find as we dive deep into the sea, this game also comes with a great gameplay that entertains even the most pretentious players of slots games. The reels are also populated by a variety of playing cards and sea creatures that will guide your lucky way to massive earnings. Here we can find symbols like the Sea Horse, the Fish, the Sea Turtle, the Puffer Fish and last but not least, the Lobster. The playing cards are present in a batch from 9 to Ace, and getting at least 3 identical symbols on an active payline will make you a winner, this being applicable to both batches, the playing cards, and the sea creatures. There is also a gambling session as you have hit a winning payline where the chances are 50/50 for you to multiply it or lose it. We also often run various uk slot promotions with this game. That is not all as the sea has lots of wonders for you to discover, by means of amazing bonuses featured in this game, such as wilds, scatters and free spins. The scatter symbol is represented by the treasure chest lying on the ocean floor, which if you land on at least 2 on the reels, you earned yourself a win. Getting more than 2 scatter symbols will get you even more rewards, as if you hit at least 3 of them you can get up to 60 free spins. All these bonus rounds are cumulative. The main character of the game, the lovely mermaid is the wild symbol in this game, as it substitutes for every symbol apart from the scatter. If you get the mermaid by your side, she will double the wins of any combination you have formed. Find 5 mermaids and you have earned yourself the lucky jackpot of this amazing slots game from Novomatic!! More casino bonuses are waiting, discover how to use mobile billing slot today! This is one of the most rewarding slots games we have played so far, with various combos available and cumulative bonuses that give you endless opportunities to multiply your stake and eventually earn a fortune. 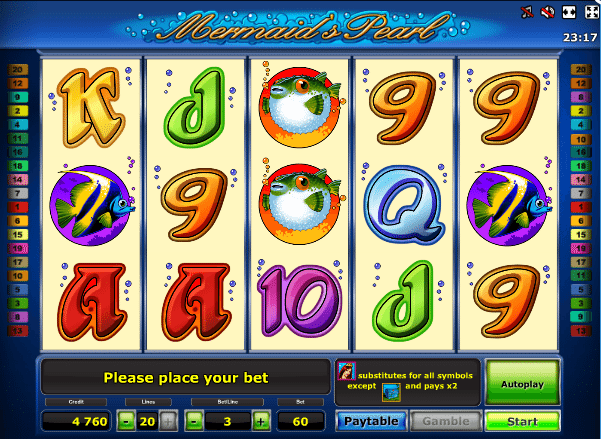 Novomatic has done a great work with this marine-themed slots game, making Mermaid’s Pearl a real diamond of a game. Now check out our Jimi Hendrix slot.